“TRY NOT TO DAMAGE IT, 007…” That famous phrase from ‘Q’ in James Bond movies applied in spades to the famed Aston Martin DB5. 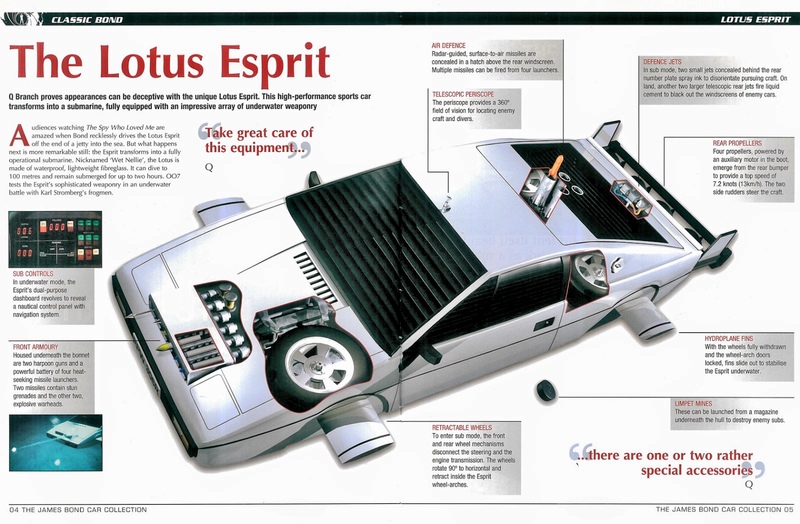 But it also related to another Bondmobile, the Lotus Esprit S1 that served double-duty as a submarine in the 1977 film The Spy Who Loved Me. Mat Irvine: Nicknamed Wet Nellie (as a back-referral to the Little Nellie autogiro in You Only Live Twice) it’s perhaps surprising that a proper model kit hasn’t been made until now. The ‘proper’ qualification is required, as a 1:32 scale kit from the Japanese Eidai company was released some years ago, but it was simplified, motorised, and - assuming you can find one today - can cost a fortune on Internet auction sites. So it’s definitely time for a 1:24 scale kit, which is what Fujimi has supplied. However, there was one slight problem in the early stages, not Fujimi’s fault, but which aspect of the multi-mode vehicle should the company choose to model? In the movie, the Esprit car-sub drives off a jetty into the sea, converts to submarine mode, does its underwater stuff, then drives out of the water and up the beach to the amazement of nearby sunbathers. But obviously it isn’t really the same vehicle. There is no way that one vehicle could do all of this, instead the movie shots were edited together from footage that used about a dozen different versions, both full size and special effects miniatures. Parts array (below). Note that the propeller components (centre right) are moulded in bronze-coloured plastic. Most of the movie's road-to-water conversion used large miniatures, which showed wheels retracting and control planes extending. However, a full-size Esprit was also seen underwater in combat sequences with enemy frogmen. In reality, it was a proper underwater craft, built by a specialist US company, using the Lotus body as a shell. It was not pressurised, the interior bearing no resemblance to an Esprit, and was operated by SCUBA-equipped divers! Fitting the steering fins for the rear propeller section (below) to the body, which was sprayed in Humbrol Gloss White acrylic paint. In the end, Fujimi development engineers chose to model the Esprit as it appeared underwater. All required external parts are supplied, so you get fins and propellers, but there are no wheels. The interior is a compromise, having only road-going equipment, not the specialist instrument panel used for submarine mode. The wheel covers were left off (below) until the black pin-stripe had been positioned. I used Bare-Metal Foil for this. However the underwater instrument panel is a bit irrelevant, as pop-up shields cover the windows underwater, so you can’t see the Fujimi Esprit’s interior clearly anyway. Frankly, the interior could be completely omitted, and it wouldn’t make much difference. However, the grilles are slatted, so the fact that model does have an interior, albeit it appears somewhat shadowy, does help with the illusion. The body nearing completion (below) with the rest of the back trim added. Fujimi supplies a stock body, with open wheel wells. Extra parts are included for the wheel covers and extended control surfaces, plus a full-length underbody pan. At the rear, a whole section emerges from ‘somewhere’ (the movie chickened out and didn’t show this) with four propellers, eight steering vanes, and two large fins. Closeup of the rear section (below) from underneath. The four strap components have just been added. Closeup of the rear section (below) from above. The rear lights have yet to be added. They are inserted from the inside. The interior (below) finished in bare-bones state, cemented to the underbody pan. The Esprit had retracting headlamps, and parts are supplied for them to be fitted in the up position. But this feature isn’t used in the underwater sequences, so it’s best to leave them retracted. However, the central rocket launcher was used in underwater sequences, so can be fitted ready to shoot. 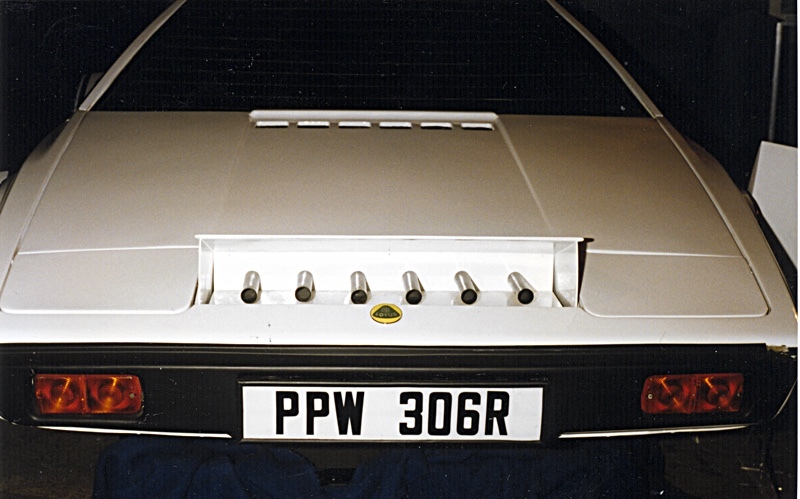 The smoke generators under the rear licence plate were used only when the Esprit was on roads. Fujimi has supplied the components, but they aren’t needed in this version. It’s good to have the choice though, and even if you leave them out of this particular model, they can always be stored in your spares box. Finished body without the interior (above, below). Note that the periscope has a small circular hatch, seen here in the open position. To help with the model build, I searched out various reference images, plus some I’d taken myself at Bond exhibitions. And it is here (of course) that you realise the inconsistencies. Some details are apparent on the full-size version, but you see they are missing, or in a different place on the miniatures. For example, the Fujimi periscope, which replaces the radio aerial, is centre-front over the windscreen, though some of my reference pictures show it mounted further back. Then there is a device that fits to the right of this, which appears in some shots, but doesn’t in others. Fujimi instructions indicate that the grilles on the sides and windscreen fit outside the window glass, but the one at the rear window should go under the glass. In fact, all grilles should be on the outside. Fujimi might have done this so the supplied rocket missile can be cemented directly to the glass - but it doesn’t look right in this position anyway, so is best omitted. The bodywork, shown (below) with a printout of some references sourced for the build. I had to decide how best to display the finished model (above, below). It has no wheels, so could just sit on the underbelly panel, but that wouldn’t look very impressive. So instead, I built a section of sea floor, and supported the Esprit with a short length of clear acrylic tube. I cut its top at an angle, so the craft could be displayed in a suitably rakish, subsea manner. In future, The Fujimi Bond Car Submarine could be accompanied by a same-scale diver or two, perhaps even a hungry shark. The angled fore- and aft-planes set to dive position (below) add a touch of realism to the finished model. Some seafloor vegetation could be a good addition to this mini-diorama. Even if they are not needed for this particular kit, road-going components will soon be relevant, because Fujimi will be releasing a stock Esprit, though first indications are that it won’t be a specific Bond car. That’s a little odd, given that a manufacturing licence must have already been acquired - maybe a James Bond version will follow as a third kit. 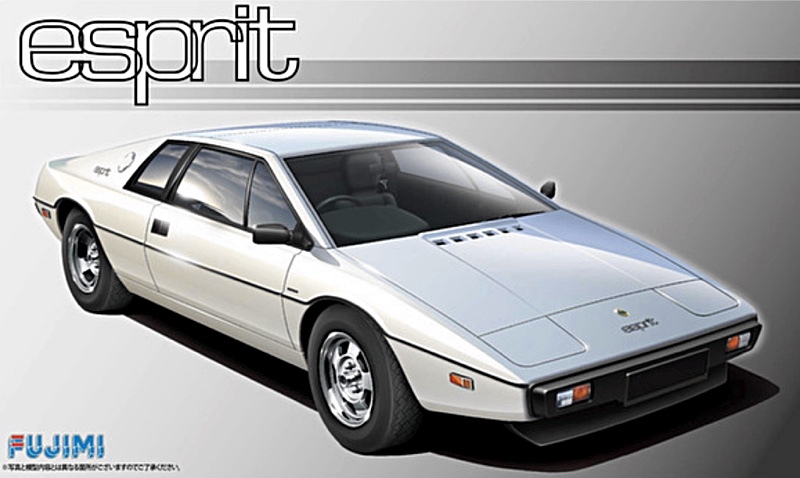 Box art (below) for the upcoming civilian Fujimi Lotus Esprit kit. A full-size mockup (above, below) as it appeared at the 1998 Bond exhibition at the Science Museum, London. Note the front lamp clusters are overall orange whereas they should be half-clear and half-orange. Also the font for the licence plate letters and numbers is incorrect. Attractive Eidai kit (below) of the car. And here's the real thing (below) in the form of a bright yellow Lotus Esprit S1, created in the 'folded origami' style of the 1970s by the ace Italian designer, Georgette Giugiaro. SMN note: Spot the futuristic attack vessel immediately behind Eidai's underwater Esprit. Now that’s a model we’d like to build. We found the excellent diagram (below) which details the Esprit's equipment. 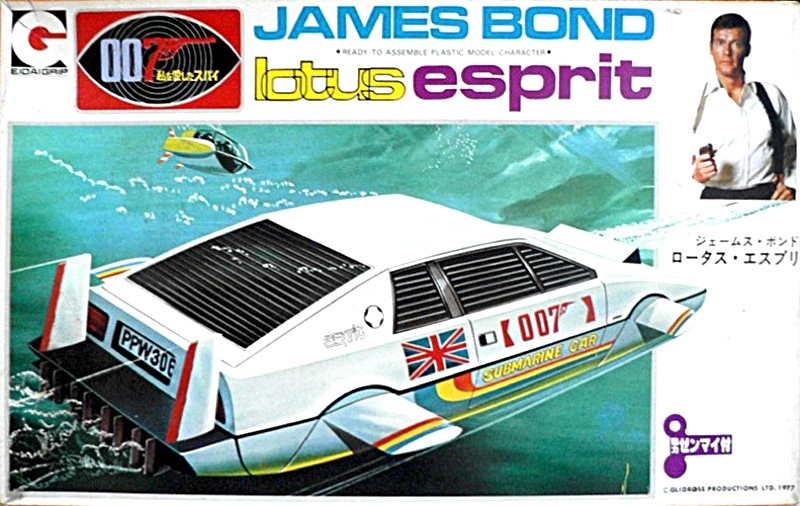 It appeared as part of The James Bond Car Collection, published by Eaglemoss some years ago. It was an interesting artwork that included a different 1:43 scale diecast vehicle with every issue. The diecasts were made by several companies, including Eligor, Norev, and Universal Hobbies. In all, 134 models were produced.